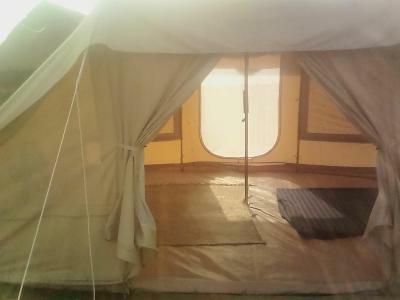 Lock in a great price for Ela Glamping – rated 8.9 by recent guests! I chose this place as it looked different from the usual guest houses and hostels I had been staying in. The pictures of it looked great. But I think it looked even better in real life. I stayed in a tent bungalow, and it was luxary. The bed was very comfortable, the bathroom one of the best on my travels. Normal sized sink, and decent shower. The french couple running it were really friendly and laid back. They served food, the two meals I had were lovely. You do need to rent a motorbike to get out to here, but I liked this as it was out of town. Even though the town was lovely also. I liked how far out of town it was - beautiful views of sunrise and sunset and hearing the calls to prayer coming from the nearby village was a bonus. Staff were friendly and welcoming and arranged moto rental for us. Would definitely recommend the pancakes for breakfast - delicious! great location, chill and helpful staff, great facilities, picturesque views- it really felt like an escape from the busy city. Our stay was perfect. The tent was really clean, cosy and the view was amazing. The french host are extremely friendly and helpful, they arrange scooters for us and cooked great burgers. I completly recommand this glamping. Food is outstanding (the couple running the quest house are French). Ambiance very mellow, somewhat family oriented but also for adults. Not too out of town - Kampot. Very peaceful location, great hosts. Most relaxing stay have had anywhere. Simple but wonderful. Great relaxing location right on the river with perfect views of both the sunrise and sunset. You will not have a better sleep with the gentle breeze off the land. The tents are comfy and spacious! The view in the morning is amazing - right at the river. The owners are very nice as well!! 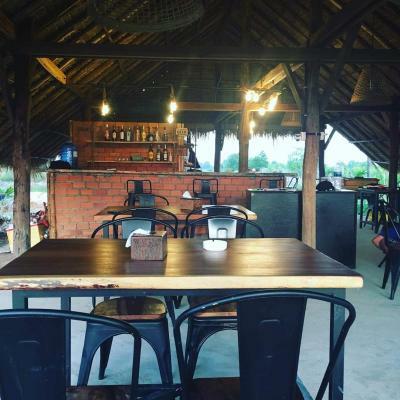 Set in Kampot, 2.7 mi from Kampot Pagoda, 3.7 mi from Kampot Night Market and 3.7 mi from Kampot Provincial Museum, Ela Glamping features accommodations with a terrace and free WiFi. The accommodations is 7.5 mi from Teuk Chhou Rapids. A continental breakfast is available each morning at the tented camp. Speaking English, French and Khmer, staff are willing to help at the 24-hour front desk. Ela Glamping offers a barbecue. A bicycle rental service is available at the accommodations, while cycling can be enjoyed nearby. Phnom Chisor is 11 mi from Ela Glamping. The nearest airport is Sihanoukville International Airport, 52 mi from the property. When would you like to stay at Ela Glamping? This tent features a view, private entrance and barbecue. House Rules Ela Glamping takes special requests – add in the next step! One of my favourite places I have been in Asia. Super cool staff and the rents were so awesome. Not shacks but clean and great bathrooms.if you want to get out of town and meet awesome people and host this is the place! We accidentally left a window open and whilst we were out the rain got all into our tent, this was completely our fault and none of the owners but made it a little less pleasant for us! Very nice experience to stay outdoors in Cambodia, the tents were huge and clean. The staff were a lovely family who made us feel welcome. It’s very peaceful and slightly out of the way, can take this either way depending on what you want! We ended up staying 2 nights instead of the planned 1 because we enjoyed being out of the way! 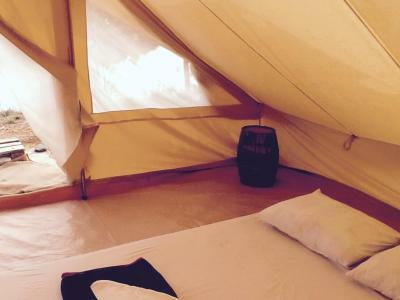 Ela Glamping was great - clean, comfortable, wonderful retreat from the touristic center Kampot. Isabelle and JP were both kind hosts, and their staff was super nice. Sunsets out there are lovely as well. Be sure to rent a motorbike or a bicycle to get around, since the location is out on Fish Island. We couldn't drive motorbikes, so it was a bit difficult for us to get to town. The road is still being built up so will likely improve, but it's a bit far and bumpy for tuk-tuks, though can be done (staff can organise one for you!). If you can ride a moto - then you will have no problem!! Also be aware there is religious music playing at 5am, (same as in other places we stayed in Kampot) and this section of the river isn't really for swimming. Gorgeous in every way! Such beautiful comfortable and clean tents. Bathroom was amazing. A real slice of heaven. The staff were wonderful, friendly and helpful. We spent the whole day just relaxing there doing nothing and loved it. Two cute dogs as well! Plus we had the cheese burger and it was SO GOOD! By far my favourite place in Cambodia. Not much to do there other than drink or eat at the bar/restaurant shack. Restaurant menu very limited, food ordinary and needs more developing (couches, chill out areas). Only WiFi is in restaurant shack and it's very unreliable so bring a SIM card. They need to landscape the area, property rocky and not very picturesque. Big opportunity with improving the area around the canal. As it's out of town, tuk tuk and taxi drivers have trouble finding it and it's badly signposted with a confusing entrance. Nice semi-rural location looking over salt ponds and rice fields. Staff are friendly although their english isn't great, they do try hard. Tents are nice and well covered by shades and good budget option for Kampot as the city and surrounds are getting very expensive.